With sincerity and hard work of our professionals, we have carved a niche for ourselves in this domain by providing a premium quality gamut of UPVC Plastic Pipe Adhesive. 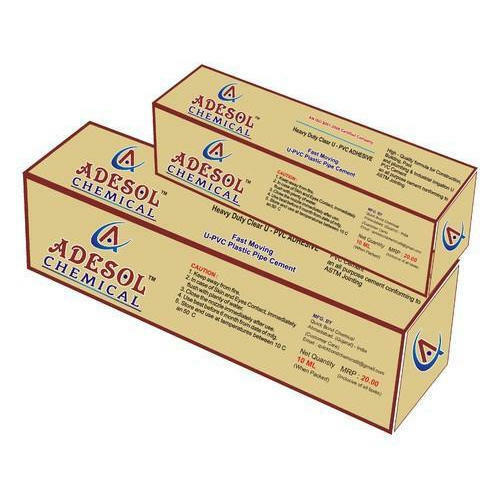 Established as Sole Proprietorship firm in the year 2014 at Ahmedabad (Gujarat, India), we “Quick Bond Chemical” are a renowned Manufacturer and Exporter of premium quality range of PVC Solvent Cement, UPVC Solvent Cement and CPVC Solvent Cement. Our Company is 9001:2015 An ISO Certified Company.Quick Bond Chemical Offered assortment is immensely appreciated for features like safe usage and long shelf life. We provide these products at reasonable prices and deliver these within the assured time frame. Under the headship of “Mr. Sandip Koladiya" (Proprietor), we have achieved a noteworthy position in the market. Our consistent efforts have won us immense recognition and reputation in the markets for offering high performance and optimum quality products. This range has been in wide demand by companies that are indulged in the works relevant to vent systems, sewage systems, and other such works relevant to water. Our professionals have to the point and correct formulation knowledge of these adhesives. Keeping all the quality standards in min, we avail this range to the customers after a final quality test of the whole bulk consignment. We have made use of high quality advanced machines in the processing. Under the visionary guidance of our mentor Mr. Sandip Koladiya, we have been able to take our firm to greater heights of recognition in the markets. His market understanding has helped us to gain the trust of clients and offer them the products as per their needs. Our workforces feel immensely motivated under his mentor ship.